Alaska's most beautiful Drive, the amazing Seward Highway is also a great destination for campers too. This is a very good highway that leads through some of Alaska's most written about territory. But what we're concerned about here is the campsites and their amenities between Anchorage and Seward, the heart of Kenai Fjords National Park. The Seward Highway has received designation as an All-American Road by the Federal Highway Administration. The Seward Highway, Route. 1 from Anchorage to Tern Lake, and then Route. 9 from the Tern Lake junction with the Sterling Highway on down to Seward. The highway leaves Anchorage on the 127-mile drive to Seward following the rocky edge of mountain peaks above a surging ocean fjord. Abundant wildlife and unfolding views often slow cars. Later, the road climbs through high mountain passes above the tree line, tracing sparkling alpine lakes. Alaska's best trail hikes are here. Bird Creek Campground: mile 101.0 of the Seward Highway: About 20 miles southeast of Anchorage along Turnagain Arm you come upon Bird Creek Campground. This is a popular camping and day use area with fishermen from Anchorage. 28 campsites, picnic area, fire pits, toilets, campground host. Excellent fishing is available in the creek for pink and silver salmon, in season. Caution: the tidal flats are extremely dangerous. Silt in Turnagain arm is like quick sand and once you get stuck your chances of survival become very slim. Activities available include, Fishing, walking, sunsets and whale watching. Portage Glacier Road has a couple small campgrounds available. The turn off for Portage Valley Road and the Begich, Boggs Visitor Center is located approximately 50 miles south of Anchorage or 77 miles north of Seward on the New Seward Highway #1. Turn onto Portage Valley Road and go approximately 5 miles to the end. Note: Portage Glacier is no longer visible from the Visitor Center, due to its retreat, the face of the glacier is still partially in Portage Lake and can be seen from a Portage Glacier Cruise. Black Bear Campground, Portage Glacier Road. This is a small forest service campground best left to small RV's and tent campers. From Anchorage go 55 miles south on Seward highway to the Portage Glacier Road turnoff located at milepost 78.9. The campground is located at mile 3.0 of the Portage Glacier Road. Williwaw Campground Portage Glacier Road. From Anchorage go 55 miles south on Seward highway to the Portage Glacier Road turnoff located at milepost 78.9. The campground is located at mile 4.1 of the Portage Glacier Road. The turn-off is located just after the rail road loading area and then across the bridge over the Portage River. Reservations must be made at least 5 days in advance. Check for available campsites at Williwaw Campground as reservations are needed here. Begich, Boggs Visitor Center: Built on the remnants of a terminal moraine left by Portage Glacier, the Visitor Center is staffed with Forest Service interpreters available to answer questions, assist with trip planning, and provide programs on the historical and natural wonders of the valley. The award-winning film, "Voices From the Ice" is shown hourly and provides a spectacular view of many glaciers and wildlife. The visitor center currently houses exhibits demonstrating "glaciers on the move" with insight into the retreat of Portage glacier. Bertha Creek Campground along the Seward Highway is located in the mountains of Turnagain Pass, this is a small semi secluded campground with 12 sites suitable for vehicle camping and tents (no RV’s it's just to small and tight). Bertha Creek Campground is located 61.5 miles south of Anchorage along the Seward highway just past the Turnagain Pass summit. No reservations are taken for the Bertha Creek Campground. There is a user pay station at the entrance to the campground the current fee is $9 a night. The campground is located near Sixmile creek, which provides Class V whitewater opportunities for rafts and kayaks. Tenderfoot Creek Campground located along the Seward Highway on the back side of Summit Lake. Popular activities include fishing, canoeing, kayaking and hiking. Located approximately 81 miles south on Seward Highway on Summit Lake. Turn at milepost 46 beside Summit Lake Lodge. This is a fun and popular family campground great for canoeing and hiking. Caution needs to be exercised as bears do frequent the area. The campground renovation was recently completed with new bathrooms, picnic tables and leveled and hard packed campsites, new foot bridge over the creek plus the addition of bear proof storage too. Ptarmigan Creek Campground 16 campsites, located approximately 100 miles south of Anchorage on Seward Highway near Crown Point. Turn at approximately Milepost 23 into campground. Entrance from the highway is well marked - Alaska State Parks Sign. Campground located in a wooded area with mountain views. Popular activities include fishing for dolly and rainbow trout and day hiking to Ptarmigan Lake. Another bear area, all food should be stored in your vehicle. Trail River Campground is located between the Trail River and Kenai Lake. Entrance is located approximately 100 miles south of Anchorage on Seward Highway near Crown Point. Turn at Milepost 24.2 on Trail River Road for 2 miles to campground. Group site is available for reservations. This campground was been completely redone in 2006 and we must say that the USFS did a fantastic job, this is a first class campground with sites designed around your outdoor enjoyment. For more information about the park, please call 907-522-8368. Seward Waterfront Camping: There is loads of camping all along the waterfront in Seward Alaska. The camping areas are operated by the city of Seward and it is very well maintained and patrolled. Alcohol is prohibited in all parks in Seward Alaska. As of 2016, the cost of camping in Seward has been increased for their RV utility site fees increasing from $30 to $40 per night, and RV dry site fees going up from $15 to $20 per night but is still a bargain as Seward is the pinnacle in camping destination on the Kenai Peninsula. Full Service Campgrounds in Seward Alaska! Most of the camping opportunities along this highway are dry sites operated by the State of Alaska or the National Park Service. Of the campgrounds offering 20, 30 and 50 amp hookups along with water and sewer, your options are limited but available. These full service campgrounds are covered separately below. NOTE: in 2013 the Seward Air Force Resort was closed due to federal budget cuts. The Army's Resort next door is still operating at full capacity. 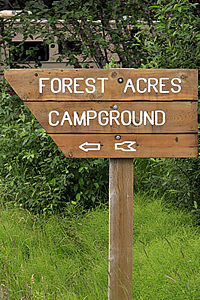 Forest Acres Campground is located just 2 miles north of Seward and just off the Seward Highway on Hemlock Street. While best suited for tent camping and smaller RV's, Forest Acres Campground is a great destination with lots of fun family activities and a great atmosphere of the Alaskan Outdoors. Spring Creek Campground off Nash Road is located on the shores of Resurrection Bay across from Seward Alaska.